Okay, kids, today we're going to look at how to fact check the PolitiFact way. We'll look at how to tell whether President Obama's signature health care reform bill, known as the ACA or "Obamacare," was a job killer. Predictions about the health care law were a dime a dozen back in 2010. Supporters contended that virtually everyone around the country would soon have access to affordable insurance. Opponents said the law would cost a fortune by adding to the national debt and killing jobs. Actually, none of those things have happened. One of the warnings that the law’s opponents issued repeatedly in the months leading up to passage was that the health care law would kill jobs. In 2011, Republicans titled the repeal legislation they were pursuing the "Repealing the Job-Killing Health Care Law Act." But independent studies didn’t back up the claims that the law would end up reducing employment, so PolitiFact has rated such statements False. Some might question whether it's appropriate to judge the ACA's effect on jobs by simply looking at employment numbers. Just assume that such people are biased and that their criticism will be drowned out by those who agree with your judgment. In the years since passage, employment in both the United States and Florida has been on an upward trajectory as the economy has recovered from a recession. What more proof could anyone need? There we have it: the facts. Because the total number of jobs increased and the unemployment rate decreased, therefore the ACA had no negative effect on the number of jobs. Seriously, how can PolitiFact take itself seriously? In the past, we've pointed out the tendency at PolitiFact to make mistakes on basic math (and the tendency of Democrats to receive benefits from those mistakes). Today PunditFact gave us another example, though this one they fixed pretty quickly when they learned something was amiss. Therefore our focus will fall not on the fact that a liberal, student Jalen Ross, gained the benefit from PunditFact's temporary misstatement of fact, but on the PolitiMath (the relationship, or lack thereof, between percentage error and PolitiFact's ratings) involved in keeping a "Mostly True" rating for Ross after fixing the mistake. Ross erred slightly in his exact wording. While white-sounding names spurred 50 percent more callbacks than the ones with black-sounding names, black-sounding names were 33 percent less likely to get responded to. The slight error in Ross' exact wording ended up exaggerating the discrimination against so-called "black-sounding names" by about 50 percent ((50-33)/33). So Ross used bad math and ended up exaggerating the key figure by 50 percent. In any event, the lowest estimate of Bush's war spending through 2008 that is even remotely defensible is $808 billion. Tack that onto the $132 billion cost of Katrina and you get $940 billion for the wars and Katrina. That's well over the expenditures expected from the Democrats' stimulus and children's health insurance bills, which total $686 billion once tax cuts are subtracted. Even if we included the cost of the tax cuts (for a total of $818 billion), he would still be wrong because that's less than the $940 billion that uses a more accurate cost of the war spending. 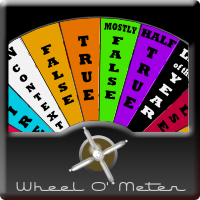 PolitiFact's ruling on McConnell's claim? "False." Hmmm. Apparently McConnell had no valid underlying point that the stimulus bill cost a great deal of money. The left-wing bloggers at PolitiFact used Israeli Prime Minister Netanyahu's address to Congress to throw out more clickbait: Come see all our fact checks involving Israel! We found their choice of photographs intriguing. After all, nothing says "objective and nonpartisan" like people with bloody hands wearing Netanyahu masks, right? The image comes from PolitiFact's Facebook page.